The most experienced and polished hurler from the Cubs college pitching heavy 2017 draft class, Thompson earned an assignment to High-A right out of spring training and then pitched well enough to receive a midseason promotion to AA, making him the only arm from the group to reach that level in their first full professional season. Once more of a power arm before 2016 TJS at Auburn, Thompson lacks some of the juice on his stuff that he once possessed prior to a 2016 TJS while attending Auburn, but he transformed himself from thrower to pitcher in the interim, and there were flashes of improved velocity and stuff at times in 2018. In a typical outing, Thompson won't blow hitters away though. Instead he changes speeds as he mixes multiple fastball types with three offspeed pitches to keep hitters guessing. When he works the edges he is effective, when he leaves pitches over the heart of the plate he gets hit hard. Thompson not only throws the standard three secondary pitches (curve, slider, change) but he also shows three distinct fastballs as well. His velocity tops out around 92-93 in most outings with his four seamer, and then he will back that up with a two-seamer a couple MPH off that, as well as a high-80s cutter. Features a low-90s sinker in most outings, but velocity can dip into high-80s at times. Does generate consistent sink, but he doesn't get much downward plane on pitch from his height and arm slot so it isn't consistent generating GBs. Will get hurt when he isn't locating well. Less effective than the 2-seamer, but will elevate his 4-seamer (92-93), and also throws cutter (87-90) to induce weak contact/break some bats. Lacks the velo to consistently blow ball past hitters up in zone, but effective at raising hitter's eye line, and set up secondaries. His curve was known as his best pitch coming out, but his slider has also developed into a solid offering. They show good bite when he keeps them down and to his glove side, but they seem to flatten out otherwise. He is willing to throw both pitches to right as well as left-handed batters. His changeup shows good arm side fade and flashes good sink as well. None of his secondary pitches rate highly, but he generates sufficient whiffs thanks to his willingness to throw each in fastball counts. Throws 12-6 curve and short, tight slider. Solid glove side command. Pitches show bite when down in the zone, but flatten out when up. Struggles to hit arm side corner. Aren't big K pitches, but both effective against RHB/LHB. Confidence to start off ABs w/ either. Changeup developing consistent fade, and occasionally flashes good sink as well. An effective pitch down and away to LHB, he will also spot it to his glove side against both LHB and RHB. It tunnels well off his two-seamer. 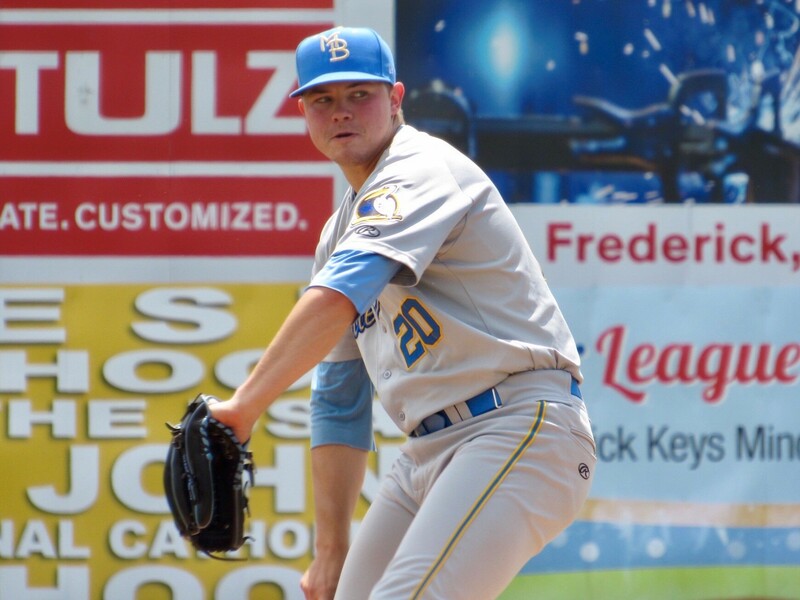 On June 14th he turned in one of the best performances of any Cubs prospect when he struck out eight batters across seven perfect innings. It was a good example of how tough he can be when he commands multiple pitches on the edges of the zone. Thompson also turned in one of the finest performances from teh #Cubs entire system in 2018. On 6/14 he tossed 7 perfect innings, striking out 8 in the process. The negatives for Thompson are pretty much the same as his positives. His stuff is solid but nothing special and he lacks one particular pitch he can rely on and/or fall back on when needed. His command is also not as sharp as you would like for a non-power pitcher. There is intent behind some of his misses outside the zone, especially the breaking balls, but he'll also catch too much plate with his fastballs on an inning-by-inning basis. Thompson attacks hitters with multiple pitches that he is willing to use in just about any count. His command is adequate, but nothing special, and his stuff is basically average across the board so it is imperative Thompson execute a plan that keeps hitters off balance every time out. Many successful Major League pitchers are migrating away from a first pitch fastball approach and Thompson is one of the few starters in the system that consistently executes this type of game plan. Thompson will get a chance in the Majors, but his low ceiling as a back of the rotation starter or swing man means he will need to quickly seize any opportunities that do come his way if he hopes to carve out a full-time role. He likely won't receive many chances if he fails initially. Thompson remained successful after his promotion to AA, but with a crowded Iowa pitching staff in 2019, Thompson is likely ticketed for a return trip to Tennessee, at least for a while. I do think he is AAA ready, or close to it at this point, but he'll have to wait his turn unless his performance takes enough of a jump to force the issue. I’ve liked this pick from the beginning. He’s got the repertoire of breaking balls & fastballs. His K/BB rate is good. Sounds like he just needs experience working on the command vs better hitters as he goes up the chain. 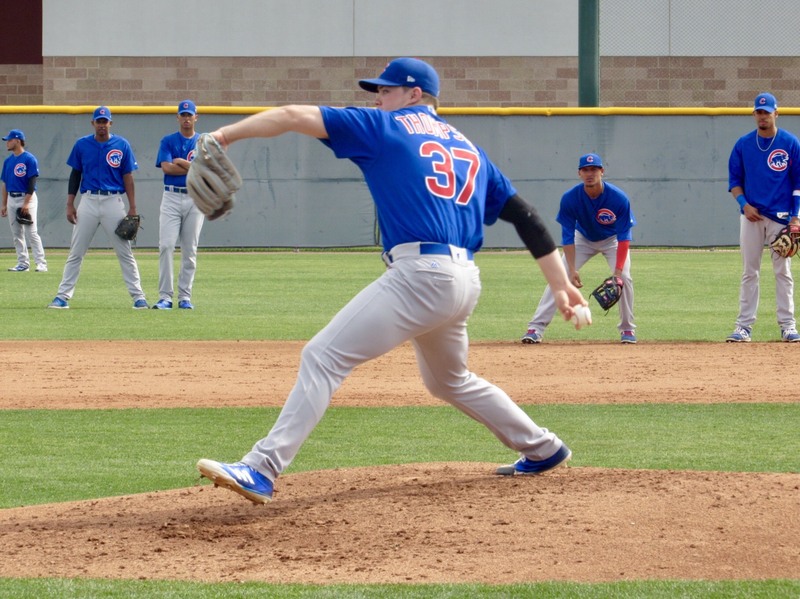 Cubs need pitchers, so the more the merrier with these prospect guys. Stack up the pitching prospects. Pretty easy to feel positive about Thompson. His AA experience should help him develop better command of his pitches. If he does, he could be at MLB level quickly. I agree, he seems to have a high floor and a respectable ceiling of maybe a #4. That’s a solid draft pick who will likely contribute soon. I think the Cubs will have their 4 and 5 spots filled via the Farm in 2020 with Hendricks leading the rotation. I believe Hendricks will be very productive into his late 30s with his easy mechanics and reliance on control. You will have to start wondering where you find a 1 and a 2/3 beyond that. He has an MLB caliber approach that separates him from many of the pitching prospects in the system right now. He has no fear and throws all of his pitches in just about every count. If his stuff or command improves just a tad more he would become a virtual lock for some form of MLB role (assuming healthy). I will be surprised if he signs for that, but at least the white sox can tell their fans "we tried..." If the Cubs could get him around that price range, I'd sure like to see them pull the trigger. Bubbles why don't you ask your inside source what's going on? "You’re an wannabe editor online lol at your life" Should read "You’re a wannabe editor online lol at your life. Fake rumor boy. LOL Bubble you're a funny dude. Now go away. I don't mind you guys discussing this stuff in the comments. As you have probably noticed, I've stopped posting rumor threads. I just don't care for rumors, don't believe 99% of them that are out there, and can't bring myself to expend the necessary energy to keep up with posts about them. We used to have a couple writers that loved this aspect of the offseason and were able to bring humor and fun into posts, but right now we don't really have anyone interested in covering them, and I think my dislike for it tends to bleed into my writing about them (which doesn't lend to good entertainment for anyone reading). He looks very much the same to me.